Sure, Seattle loves its coffee, but you can’t attribute the buzz on the streets to an excess of caffeine. (Though it doesn’t hurt.) 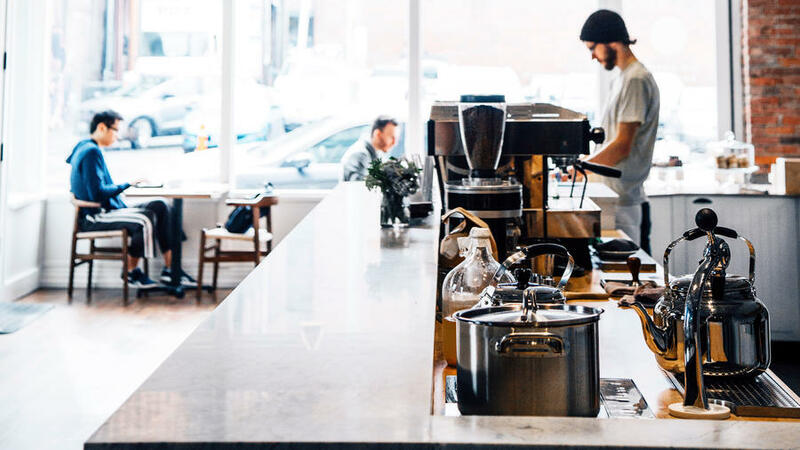 From the restaurants in Pioneer Square to the hipster boutiques in Ballard, this city has an energy that no amount of drizzle can quench. Local 360. At this locavore joint, breakfast is served with an undeniable Southern spin. Reclaimed Douglas fir booths, tables, walls, and floors, though, make for an ultra-Northwest interior. Daring diners surrender to the fried chicken, a bacon mousse-lined roulade piled on cheddar grits and topped with an oozy egg. $; 2234 First Ave.; www.local360.org. Coyle’s Bakeshop. Selling classic viennoiseries (that’s French for “amazing chocolate croissants and other addictive baked goods”) that emerge hot from the oven all morning long, this bright, busy spot slows down slightly in the afternoons, when the cake-and-tea crowd enjoys owner Rachel Coyle’s famous passion-fruit tarts with pots of Earl Grey from Kusmi Tea in Paris. $; 8300 Greenwood Ave. N.; coylesbakeshop.com. Elm Coffee Roasters. In a city known for its caffeine addiction, Elm Coffee Roasters aims to raise the bar. Owner Brendan Mullally returned to Seattle in 2013 after seven years with Joe Coffee in New York. He teamed up with Stumptown alum Drew Fitchette, who brings well-established relationships with farmers and, often, access to “micro lots” (a farm’s best coffee). The menu lists espresso drinks as well as housemade chai and hazelnut milk. $; 240 Second Ave S.; elmcoffeeroasters.com. Delicatus. Those craving Northwest grub in the form of a “higher sandwich” head to Delicatus, where friendly lunch-counter debate breaks out among menu-designated “Progressives,” tucking into specialties like the spicy Shank Lamb, and “Traditionalists,” opting for standards like the Classic Reuben. $$; 103 First Ave. S.; delicatusseattle.com. Serious Pie. Seriously good pizza and serious coffee share the spotlight at the Capitol Hill branch of Tom Douglas’s pizza mini-empire, which is housed in the wildly popular Starbucks Reserve Roastery. Here, you can bite into golden, crispy-yet-chewy pizza crust topped with fennel sausage and cherry-bomb peppers and, afterward, wander into the main coffee theater for an espresso made from beans available only at this store. $$; 1124 Pike St.; seriouspieseattle.com/pike. Delancey. This the Brooklyn-style wood-fired pizza project of Brandon Pettit and Molly Wizenberg, whose foray into the restaurant business was immortalized in Wizenberg’s best-selling book Delancey: A Man, A Woman, A Restaurant, A Marriage. Drop by the steamy-windowed Ballard storefront and try a simple Brooklyn pie (tomato sauce, fresh and aged mozzarella, grana). $$; 1415 N.W. 70th St.; delanceyseattle.com. Good Bar. Chef Josh Kelly and bar manager Adam Kachman have created seasonal menus that are as classy as the old Japanese Commercial Bank building in which the bar resides. Order the Triple Six (reposado tequila, lime shrub, cassis, and ginger beer) or the Notre Glorieux (brandy, lemon, botanical simple syrup, sparkling wine). As for food, you can’t go wrong with anything on the menu: mussels with preserved lemon, salt-roasted fingerlings, and the fanciest sloppy joe you’ve ever experienced (Painted Hills beef, tomato, stout, and roasted onion aioli). $; 240 Second Ave.; goodbarseattle.com. Trove. Chefs Rachel Yang and Seif Chirchi have been spreading the kimchi revolution to Capitol Hill. Under one roof, you’ll find a DIY Korean barbecue joint, a noodle bar, a regular bar, and a parfait place. Make a night of it: Start by sharing the rice cake noodles with lamb curry in the noodle zone, then order a beer at the bar and put your name in for a barbecue table in back. Cook up the giant tower of local meats (options include hanger steak, pork belly, and Wagyu tri-tip) on your tabletop grill, then head outside for a parfait, such as apple pie with vanilla custard and curry caramel, from the ice cream “truck” built into the side of the building. $$$; 500 E. Pike St.; troveseattle.com. Little Uncle. Their crazy-popular Capitol Hill walk-up window led chef-owners PK and Wiley Frank to seek a little more elbow room in this cozy basement, where they serve ma-and-pa-style Thai food such as curried lamb roti, spicy beef salad, and housemade northern Thai sausage. For those who can’t choose, the husband-and-wife duo’s current rendition of pad Thai is a sure thing. $; 88 Yesler Way; littleuncleseattle.com. Humble Pie. Off the beaten path, but so worth seeking out, Humble Pie serves pizza from a wood-fired oven and local beverages out of a retired shipping container in the International District. Most of the seating is outside at picnic tables—you feel like you’re in someone’s backyard. A chicken coop provides the eggs topping some of the pies; a rooftop garden, the basil. Our favorite pizza is the apple and spiced walnut with bacon and Beecher’s cheese. $; 525 Rainier Ave. S.; humblepieseattle.com. Brimmer & Heeltap. In the same bright Craftsman space that for decades housed the Seattle institution Le Gourmand, Brimmer & Heeltap combines the relaxed vibe of a corner pub with a shareable Asian-inflected bistro menu. Dishes include the likes of broiled pork shoulder with a caramelized onion kimchi, and a Dungeness crab “trifle” (crab custard, brussels sprouts, and brioche). Most items are available in small or large portions, so you can sit out on the tiny patio, sip wine, and try one of everything. $; 425 N.W. Market St.; brimmerandheeltap.com. Miller’s Guild. Anchored by a 9-foot-long wood-fired grill whose glowing coals lend Flintstones-worthy dry-aged cuts a beach-bonfire flavor, chef Jason Wilson’s Seattle flagship fulfills carnivorous fantasies—the beef short rib is bigger than the plate it sits on—but also puts a smoky spin on expertly charred vegetables like radicchio and cauliflower. $$$$; 612 Stewart St.; millersguild.com. Red Cow. After having made his name in Seattle with primarily Italian fare, restaurant giant Ethan Stowell has branched into French cuisine with Red Cow, a traditional steak-frites spot where cast-iron-seared cuts come with crisp, double-blanched fries and a pot of aioli and well-made charcuterie—think rabbit terrine, served with housemade hazelnut mustard, or classic pork rillettes—earns him cred in the city’s French food circles. $$$; 1423 34th Ave.; ethanstowellrestaurants.com. Loulay Kitchen & Bar. A big helping of joie de vivre came to downtown Seattle with Loulay Kitchen & Bar, the updated French spot from “Chef in the Hat” Thierry Rautureau that appeals to every level of craving, from burgers at the bar (Loulay’s juicy standout is made with prime rib and shoulder and topped with bacon shallot jam) to romantic dinners (braised rabbit, a rib-eye steak) in high-backed, Hollywood-style booths. $$; 600 Union St..; thechefinthehat.com/loulay. Canlis. In 2008, this landmark ditched the sauced fish fillets and chops that made it famous, and recruited chef Jason Franey from Michelin-starred Eleven Madison Park in New York City. Now classics like prawns sautéed in dry vermouth appear alongside Franey’s more modernist smoked foie gras. The restaurant’s 180° views of Lake Union and the Cascade Range remain, as do traditions that require men to don a jacket to sit at certain tables. $$$$; 2576 Aurora Ave. N.; canlis.com. Hot Cakes. The menu at sweets wizard Autumn Martin’s Ballard dessert lounge is like an ode to Willy Wonka: signature desserts, baked to order; grilled chocolate sandwiches; even boozy milkshakes like smoked chocolate with Scotch. Martin, a former Theo chocolatier, has created a space that’s as inviting as the treats: brick-lined walls, reclaimed wood, and a two-seat bar. $$; 5427 Ballard Ave. N.W. ; www.getyourhotcakes.com. Schilling Cider House. In September 2014, just in time for the autumn apple season, the nearly two-year-old Schilling & Company cidery opened Schilling Cider House, a bar that carries hundreds of bottled ciders and 32 ciders on tap—including, of course, the cidery’s own dry-hopped hard ciders, made with Washington apples. $; 708 N. 34th St.; schillingcider.com. Le Caviste. In a bright Denny Triangle space, Le Caviste is a bistrot-à-vins in the traditional French sense, where in addition to a deep selection of Beaujolais crus, you can order cheeses and charcuterie, like the smooth housemade mousse de foie de volaille. Le caviste himself—David Butler, formerly the sommelier at Le Gourmand—designs the selection of warm bites to be small and reliably French, with maybe one entrée but not a full menu. $$; 1919 Seventh Ave.; lecavisteseattle.com. Frolik Kitchen + Cocktails. Blame the cloud cover, but Seattle is sadly lacking in rooftop bars. With killer views and a long happy hour (every day from 4 to 10 p.m.), Frolik fills that void—and then some. There’s shuffleboard and table tennis, a patio fireplace, plus a cocktail list that embraces local, seasonal ingredients—try the Seattle Sazerac, made with Oola Whiskey from Capitol Hill. Best of all, because it’s elevated, you’re out of the downtown rush but still in the thick of it, with glimpses of Puget Sound to boot. $$; 1415 Fifth Ave.; frolikseattle.com. Rhein Haus. The cavernous, nouveau-Bavarian beer hall formerly known as Von Trapp’s has a strong craft-beer list, brat-centric fare, and five indoor bocce courts, which you can reserve. There’s a full food menu, and about 30 beers on tap. $$; 912 12th Ave.; www.rheinhausseattle.com. Ballard Inn. At the revamped and renamed Starlight Hotel, glass chandeliers and Victorian couches are a nod to its 1902 roots. Sure, most bathrooms are shared, but you also get instant access to the restaurants and boutiques lining Ballard Avenue, one of the hottest spots in Seattle. $$; 5300 Ballard Ave. N.W. ; ballardinnseattle.com. Hotel Ballard. The Ballard channels the neighborhood’s maritime past with Scandinavian accents in the 29 rooms. Not a guest? You can still dig into handmade pastas, grilled veggies, and barrel-aged cocktails at its Stoneburner restaurant. $$$ ; 5216 Ballard Ave. N.W. ; hotelballard.com. Hotel Five. The renovated Hotel Five is not only more vibrant than many downtown Seattle chain hotels—multicolor doors, graphic paintings, decidedly friendly staff—it’s also more affordable. Plus, it’s within walking distance of Pike Place Market and Seattle Center, and only 85 steps from the flagship Top Pot Doughnuts (yes, we counted). If that’s too far, there are complimentary cupcakes in the lobby. $$; 2200 Fifth Ave.; hotelfiveseattle.com. Palladian Hotel. Finally, a hip yet central place to stash your visitors. The decor, designed by San Francisco–based Nicole Hollis—who’s made a specialty of high-end lodgings—nods to the building’s 105-year history: Old maps are framed as art, television screens are set into easels, and the dark-hued lobby has the feel of a speakeasy. Then she mixed in modern minimalism (tchotchkes are sparse) and some random pop culture (pillows adorned with the portrait of a celebrity—Leonardo DiCaprio, say, or Tom Selleck). The 97-room hotel is also close to the Westlake Link light-rail station (read: easy airport access). $$$; 2000 Second Ave.; palladianhotel.com. Volunteer Park Conservatory. The 103-year-old facility—divided into five sections or “display houses” (Bromeliad, Palm, Fern, Cactus, and Seasonal) and containing more than 1,200 species of plants—has a fully updated glazing system and steel earthquake reinforcement. Admire the beautiful new laminated safety glass as well as the impressively large specimens, such as the Cactus House’s 99-year-old jade plant. $; 1400 E. Galer St.; volunteerparkconservatory.org. Seattle Art Museum. Outside, permanently affixed to SAM’s second story for all to see, is the 70-foot-long piece called Mirror, a massive LED screen with images that change based on weather conditions, traffic, and pedestrian movement from multimedia artist Doug Aitken. Digital sensors provide the data, which might trigger, say, a video of a sailboat on Lake Union on a quiet day, or a fiery sunset during rush hour. Inside, you’ll find many equally noteworthy works in the well-curated galleries. $$; 1300 First Ave.; seattleartmuseum.org. Paris Eastside. Muriel Foucher’s tiny culinary school and kitchen shop teaches French cooking without Le Cordon Bleu formality. Foucher keeps the pace relaxed, giving participants time to mingle while picking up the secrets to featherlight macarons or a perfect bouillabaisse. Class topics are an eclectic mix, ranging from microwave French cooking (she’s even written a book about it) to classics like tarte tatin. $$$; 816 E. Pike St.; pariseastside.com. Ballard Locks. Just 1/2 mile from Ballard Avenue, the Hiram M. Chittenden Locks (or in local parlance, the Ballard Locks) are a landmark of Seattle maritime history. They’re also a fine place to watch boats being raised as they pass from Puget Sound to Lake Washington, or salmon as they migrate up the fish ladder to their spawning ground. $; 3015 54th St. N.W. ; seattle.gov/tour/locks.htm. Museum of History and Industry. A mind-boggling collection of more than 3 million artifacts, now occupying the restored Naval Reserve Armory on Lake Union’s south shore, brings Seattle history to life. Tip your head back in the atrium to check out Boeing’s first airplane, or tour local icons like the Post-Intelligencer’s first printing press and J.P. Patches’s patchwork clown coat. On a sunny day, take a turkey-and-Beecher’s-cheese sandwich from the cafe to the terrace and check out the historic ships docked in the wharf. $$; 860 Terry Ave N.; mohai.org. Olympic Sculpture Park. The West’s greatest sculpture gallery without walls is Seattle Art Museum’s Olympic Sculpture Park on downtown’s waterfront. There are a whopping 21 sculptures, including an enormous typewriter eraser and rusted-steel waves. Summer is an ideal time to visit, for food trucks, free yoga, live music, and dance performances. $; 2901 Western Ave.; seattleartmuseum.org. Great Wheel. The 16-story Ferris wheel, with 42 fully enclosed gondolas, opened in June 2012 as the newest addition to the city skyline on what was a mostly empty stretch of Pier 57. At the top of the revolution, you get a panoramic view of Mt. Rainier, the Olympics, and all of downtown, then as you descend, thrilling views of the water below. $$; 1301 Alaskan Way; seattlegreatwheel.com. SIFF Cinema at the Uptown. Lower Queen Anne’s historic 1926 Uptown theater reopened in 2011 as the SIFF Cinema at the Uptown. Now owned by the Seattle International Film Festival, it has all the bells and whistles of a modern multiplex (digital projection, 3-D, better audio) but retains its art house spirit, with a mostly indie lineup and local treats like Theo Chocolate at the popcorn stand. $$; 511 Queen Anne Ave. N.; siff.net. Museum of Flight. Taken for granted, maybe, or perceived to be a bit too touristy, this museum is a treasure hidden in plain sight. Along with all the hands-on control-tower demos and dogfight simulators that any gadget-happy kid, or adult, would love, the museum’s collection of more than 160 planes and spacecraft includes the only Concorde on the West Coast—and yes, you can climb aboard and pretend to be Becks and Posh, or Liz Taylor, or Mick and the lads. $$; 9404 E. Marginal Way S.; museumofflight.org. Pike Place Market. 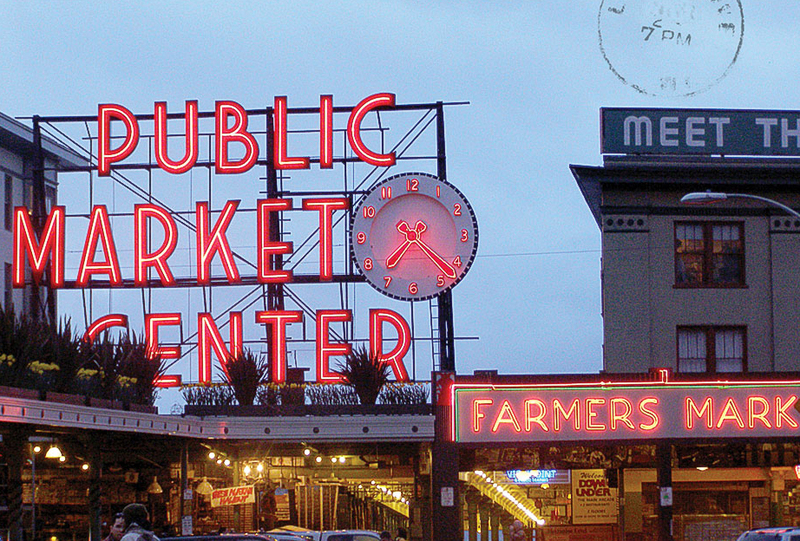 If the Space Needle is the angular face of Seattle, Pike Place Market is its unquestioned heart. In 1907, the first six farmers at the market sold all their produce within minutes. It has been the model for urban farmers’ markets ever since. Pike Place now has hundreds of vendors who sell everything from tie-dyed onesies to Treasure Cove oysters—all to the delight of the market’s 10 million annual visitors. Start with a latte at Storyville, just right with an amandine croissant from Le Panier. Pick up alderwood-smoked king salmon from Pure Food Fish—it’s been here since 1911—and a gigantic $10 bouquet in the main corridor. $$; 85 Pike St.; pikeplacemarket.org. Moorea Seal. The shop sells modern and rustic jewelry, fashion accessories, and artwork from around the globe, as well as products made close to home: Hole-punched leather handbags by Pine & Boon are displayed on floor-to-ceiling wooden shelves; powder-coated brass bangles by Baleen adorn a large display table; potted succulents mingle with stoneware vessels on floating shelves; and the scent of a moss-rose-vetiver soy candle fills the air. $$$; 2523 Third Ave.; mooreaseal.com. Niche Outside. At Nisha Klein’s nature-inspired boutique, the emphasis is quality, not quantity, which is apparent in the medley of goatskin gardening gloves, seasonal botanical soaps (for spring: oak moss/violet/freshly cut grass), and the fleur du jour. (June portends white peonies, for example.) A varied vessel collection features madrona burls from Orcas Island and limited-edition vases by local ceramist Jeffry Mitchell. $$; 1424 11th Ave.; nicheoutside.com. Kurt Farm Shop. Kurt Timmermeister (Vashon Island’s celebrated cheesemaker and author of Growing a Feast) brings his farm to the city via ice creams courtesy of his cow, Dinah, and her bovine pals. Emphatically not a “peanut, toffee, pecan, and marshmallow kind of guy,” Timmermeister makes simple yet unusual flavors: lemon verbena, tomato jam, Chinese plum sauce, and a cheesecakeish variation born of his Flora’s Cheese. He also sells 12 Washington State cheeses, such as Tieton’s Rheba and Beecher’s Flagship, plus plant starts so high-rise gardeners can harvest their own strawberries and tomatoes. $$; 1424 11th Ave.; kurtwoodfarms.com. Freeman. Located in the historic Loveless Building (it originally housed artist studios in the 1930s), Freeman carries both its own menswear designs (like the signature hooded raincoats) along with other rugged West Coast labels like Filson, Crescent Down Works, Jungmaven, and Tellason. Everything is functional but timeless—things you can wear to work, to dinner, or on a hike—and it all must live up to Freeman’s own standards: clothing made so well, it’s meant to be bought only once. $$$$; 713 Broadway E.; freemanseattle.com. Glasswing. Looking for a creative gift? A few interesting plants? A whole new wardrobe? Next to Capitol Hill’s popular Melrose Market, Glasswing is a fashion and home goods store that resembles a museum of 1940s Americana—from brick walls and rusted steel equipment carts to a claw-foot bathtub filled with ferns. Don’t miss the results of Glasswing’s collaborations with Seattle designers: linen shirts by Tarboo, Red Clay soap by Herbivore Botanicals, and illustrated notebooks by Stacey Rozich. $$$; 1525 Melrose Ave.; glasswingshop.com. The London Plane. Farm-to-table darling Matthew Dillon and organic florist Katherine Anderson of Marigold and Mint came together to create the modern locavore’s dream market: The London Plane, a retail shop, wine bar, and event space. In a prime Pioneer Square spot, across the street from Dillon’s Bar Sajor, shoppers can browse cookbooks, housewares, and winter blooms, then linger over a glass of Sancerre and a cheese plate at one of the communal tables. $$; 322 Occidental Ave. S.; thelondonplaneseattle.com. Marx Foods. What do you get when a continent-hopping, tech-loving food geek opens a grocery? Marx Foods, Justin Marx’s specialty-foods shop in lower Queen Anne. Inside the small store, exotic ingredients like hibiscus vinegar, dill pollen, and maple cream sit neatly on cherry shelves, across from a glass case filled with larded Mangalitsa bacon and other boutique meats. Not sure what to do with that kangaroo steak? QR codes throughout the store connect shoppers to Marx’s vast online resources, including video introductions to unusual ingredients like geoduck clams and fregola sarda (an Italian couscous), and recipes for how to use them at home. $$$; 144 Western Ave. W.; marxfoods.com. Totokaelo. In its new, larger location, this popular fashion brand has branched into home furnishings. Look for Native American–inspired woven wall hangings by Justine Ashbee, and owner Jill Wenger’s furniture line. $$$; 1523 10th Ave.; totokaelo.com. Seattle Art Museum Shop. Like the museum itself, the SAM Shop stars a mix of global and local designers. Look for SAM-edition totes by Alchemy Goods (made from exhibit banners), polka-dot bow ties by Michael Cepress, and ceramic vases by Material Good. $$$; 1300 First Ave.; www.seattleartmuseum.org/visit/shops.